Several features set Leatherjackets apart from other fish species, these include: a small mouth with beak-like teeth, rough sometimes sandpaper like skin, small gill openings, and a single serrated spine on the top of the head that fits neatly into a groove. Most Leatherjackets are considered opportunistic feeders and readily feed on many different items including algae, crustaceans, molluscs, fish and polychaete worms. Are generally found under 1 kg in weight but some offshore species can grow to 3 kg. 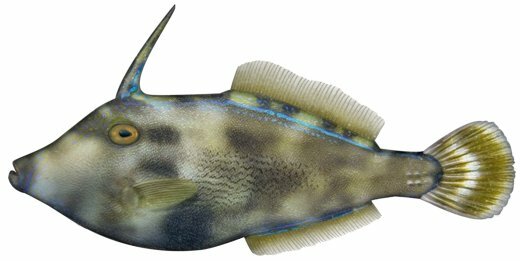 There are more than 20 species of Leatherjackets found throughout NSW waters and, depending on the species, can be caught in estuarine, coastal and offshore waters to depths of 250 m or more. In estuarine waters these fish are often found around artificial structures such as pylons and wharfs or are found near seagrass beds e.g. Fan-belly, Six Spine and Rough Leatherjackets. In coastal and offshore areas they can be found on rocky reefs, sand/mud bottom or in sponge beds e.g. Six Spine, Yellow-finned, Black Reef, Velvet and Chinaman Leatherjackets. Could be confused with Triggerfish, however these fish have a dorsal fin rather than a single, serrated dorsal spine.